Children will have a magical camping experience in accommodation structures full of character. 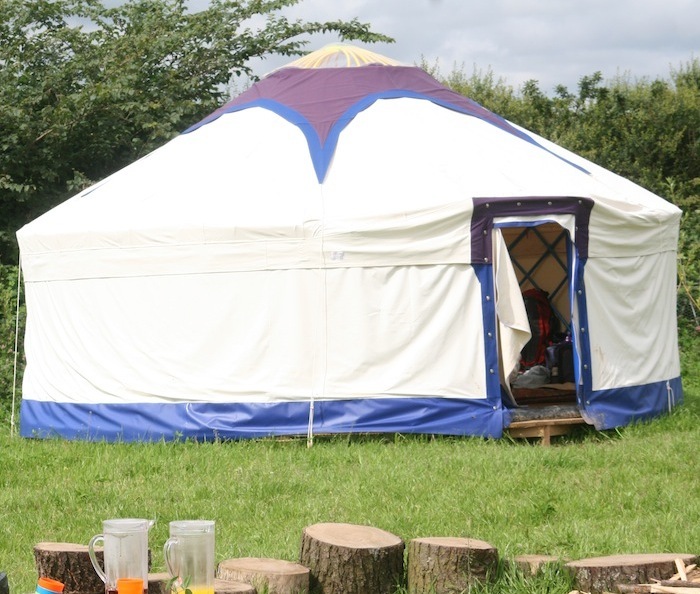 There is a range of timber framed and canvas accommodation at camp from the traditional bell tent to the more alternative geodesic dome design. These hand-made structures enable children to experience other cultures solutions for temporary shelter and discover what it's like to live in the round! Inspired by the upturned boat hull sheds at Lindisfarne we decided to create one right here at camp with the help of a local boat builder. Children love the port-holes as you can see! Designed by the American engineer Richard Buckminster Fuller in the late 40's as an ecologically efficient solution to the housing shortage, the design was later embraced by people seeking an alternative lifestyle in the 70's. Fuller was the first person to coin the phrase 'Spaceship Earth'. He strongly believed that the creative abilities of mankind were unlimited and that the use and development of technology and design-led solutions would create a positive future. An older, more traditional style of yurt, the ger has existed for thousands of years and is still used by Mongolian nomads today. It can be erected and dismantled in under an hour and the best bit for us is it's inherent strength and wind resistance - perfect for the top of a hill in Cornwall! Traditionally the ger frame is built using wood such as willow or birch. We constructed ours by re-using donated alkathene pipe which, having been extruded to the wrong tolerance during manufacture, would otherwise have been a waste material. Tipis were used mainly by Plains Indians who moved across the Great Plains following migrating herds of buffalo. The boys seem to naturally migrate to this structure at camp and its perfect for warm weather as we can adjust the smoke flaps for some natural ventilation. The bell tent was adapted from the 'Sibley Tent' design by Henry Sibley, who in turn, took his inspiration from the native American Indian tipi. The yurt differs from the ger in that its roof poles are steam bent. Charlie hand-built this yurt using a mix of Sweet Chestnut, Willow, Ash, and Hazel.